Power shapes our lives. From everyday interactions with friends and colleagues to debates about the most divisive social issues, power is a key to understanding why people act the way they do. Orangreenia (pronounced “Orange-Greenia”) is the only simulation that teaches about the use and abuse of power and unlocks the concept of “intersectionality”—an indispensable solution for making change. Orangreenia is a simulation, a real-time diversity training activity, in which participants become part of the microworld called Orangreenia. Participants become representatives of one of three cultural groups within Orangreenia and make key decisions about taxation, charity, emergency subsidies, and schools. Each group has different cultural characteristics, wealth, and access to power. As decisions are made, participants gain a gut-level understanding of what it means to both wield and be subject to societal power. Orangreenia also challenges participants to test the idea of a “colorblind” society. All the inhabitants of Orangreenia have many characteristics in common—but are those commonalities enough to ensure social equality or even individual communication? This key question of intersectionality, how overlapping cultural identities shapes experience, is another unique component of the simulation. Orangreenia encourages thoughtful discussion about social power and intersectionality, but people also report that their insights are life-changing, deeply-felt, and long-lasting. Participants learn lessons in societal dynamics that alter their perspectives on why and how they treat others. They have more compassion and empathy, and are more energetic and insightful in dealing with conflicts. Orangreenia is designed for adults and students in the tenth grade or higher. Persons and organizations concerned about the use and abuse of power and/or the analysis of intersecting cultural identities. Educators who want students to have an immersion experience in societal power and class structure. Orangreenia can be used for classes in sociology, political science, history, psychology, critical race studies, feminism, and ethnic studies. Businesses that want to help their managers and employees understand how power differences and cultural identity affect performance and motivation in a diverse workforce. What are some of the important ideas that Orangreenia teaches? Power, and the control it offers, feels good. It can easily be misused. Often those who think that they are immune from the temptations of power are vulnerable to it. Group identity strongly influences individual action. What seems fair depends on power differences. Those with power often have a different view than those without power. Systems of power are complex, subtle, and often unseen. Systems of power can lead to oppression. Individuals are often oblivious to how they participate and maintain systems of power. People in power often pit powerless groups against each other to serve their own interests. When systems of power become oppressive, there is always the possibility of protest and rebellion. Language can be used to disguise or ameliorate the harsh use and effects of power. Everyone has intersecting cultural identities. Society and individuals elect to prioritize certain identities at specific times. Understanding how societies prioritize identities in individuals and how individuals prioritize their own identities helps us understand how society influences individuals and how individuals view the world around them. Intersecting identities may be in conflict; people resolve conflicting identities by emphasizing one identity over another. People often use a power identity to trump a powerless identity. The plight of people who are subject to multiple identities that are oppressed is not the same as for those who are subject to only one oppressed identity or none at all. How long does it take to conduct Orangreenia and how many persons can participate in a session? Orangreenia takes about 90 minutes to conduct. Later discussion can be between 30 minutes to several hours depending on the depth of the conversation desired. A minimum of 9 and a maximum of 36 persons can participate in a session. (Call us at 856 235-2664 for information on how to use Orangreenia for larger groups.) Your purchase of Orangreenia allows you to conduct an unlimited number of simulation sessions. How much prep time is required? Orangreenia can be set up in about 15 minutes. What is included with Orangreenia? Do I need anything else to conduct Orangreenia? We suggest that you supply each participant with a pen and a blank sheet of paper for note-taking or have each participant bring those items to the simulation. Otherwise, all materials needed to conduct Orangreenia are included. What are people saying about Orangreenia? The simulation was developed by the Beyond Diversity Resource Center, a nonprofit organization dedicated to diversity/anti-oppression education. Robin Parker and Pamela Smith Chambers, the executive director and training director of the Center, created Orangreenia so that there would be an experiential activity people could use to learn about social power and intersectionality. 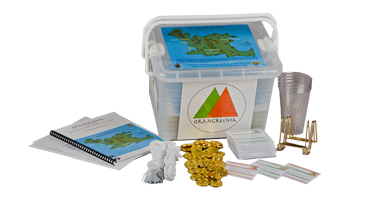 Orangreenia has been extensively tested and has proved to be a powerful diversity training tool. Parker and Chambers are known for their high-impact, experiential work in diversity and have received numerous awards and commendations from civil rights, social justice, and government organizations. They designed Orangreenia so that participants will advance their learning, have lots of “aha” insights, and enjoy themselves. How much does Orangreenia cost? How to purchase? $365 (plus sales tax for New Jersey residents only). Shipping is at no extra charge within the contiguous United States. Strong demand for Orangreenia requires us to ask for patience with your order. Please allow two weeks for shipping.